<?xml:namespace prefix = w />Cabinet cooling products help protect entire home theater and audio video systems installed in cabinets and entertainment centers by dispersing the accumulation of heat generated by the systems as a whole. These products in particular have been designed for venting and cooling cabinets and enclosures and allow for flexibility in how systems are installed and used in cabinets in regard to the naturally occuring heat from components. If you have been having to leave your cabinet doors open because of heat, these are the products to solve your overheating issues! 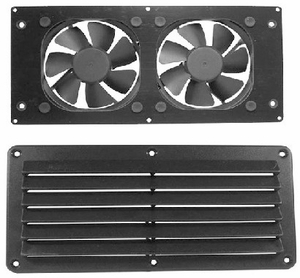 Cabinet Vent (VS-CV) - The Cabinet Vent is our best selling product for easily cooling cabinets and enclosures. The unit draws fresh air in or exhausts the heated air from the cabinet and away from components. Available in Black, White, Tan and in Packages. Slim Vent (VS-SV) - Similar to the Cabinet Vent except it does not require as much mounting depth but does not move quite as much air at quiet settings. Available in Black & White. HiFlo Lite Vent (VS-HFL) - The HiFlo Lite unit provides more aggressive venting than the Cabinet Vent. Available in Plastic - Black, White, & Tan and in Wood - Maple, Oak, & Teak. HiFlo Vent System Basic (VS-HFB) - The HiFlo Vent System is very extreme situations as it moves a very significant amount of air. Available in Plastic -Black, White, & Tan, and in Wood - Maple, Oak, & Teak. Toe Kick Vent System (VS-TKV) - Draws air into a cabinet through the bottom toe kick. Available in Plastic - Black and White, and in Wood - Maple, Oak, & Teak. Universal Cooler (CP-UC) -For venting (intake or exhaust) racks, entertainment centers, cabinets, recessed TV enclosures, etc.